In this section I will describe our summer sailing onboard Alma Libre our Super Maramu 2000.
through the Aegean on their way to Turkey or other East Med port. Captains Commentary:We started early in the morning after visiting the Corinth market for fresh provisions of fruits and bread. I like very much to visit the local markets and buy fresh products.The wind was force 4-5 Bft and we had very nice sailing for 2 hours then the wind came down and we had to start motor sailing towards Troizonia my favourite place. All of the sudden the motor started to increase rpm. Immediately I reduced the throttle and opened the engine room which was messed with red colour Automatic Transmission Fluid (ATF) . The problem started from a leak between the hydraulic gear box and the valve of the break. I was able to locate the leak and stop it but I could not use the motor as the quantity of ATF I had with me was not sufficient and I was afraid that by using the motor without enough ATF I could damage the hydraulic gear box and ruin my vacation. . In the mean time I unscrewed the large screw in the back of the break cylinder in order to disable the break as it needs a lot of hydraulic pressure to be disengaged when you start the engine and I continued by sails ( 9 hours) until the next port to find and put ATF. In the port I got some ATF from a cruising boat and I could continue my vacation without any further problem. So carry with you at least 3 Litters of ATF it may be necessary in case of a leak We arrived in Troizonia happy that the adventure had a happy end. We had a nice dinner in a fish taverna near the sea and we forgot the mishap as always. Captains CommentaryIt seems that the engine problem is solved. I pushed the engine a little more hard in order to understand if something is not in order as Patras is a big city and you can find technicians to fix everything but it was not necessary just bought a few liters of ATF just in case. This time the distance was short but in Patras the marina is very smelly and it was not very pleasant. The weather was very hot and it was good that we could use the air-condition of the boat in order to cool it down. We were waiting for our friends to board their boat , as Erini was already there with her crew waiting. Our friends came around 6 oclock and the girls were very happy to find company. We exchanged a lot of sailing stories about our adventure and we had a lousy dinner in a very nice and well located restaurant near the marina. Captains CommentarySo it is always nice to leave a city and sail to the islands. 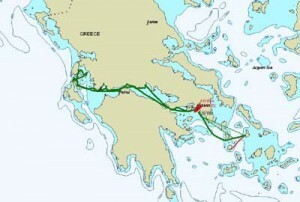 We have done all the provisions and started our sailing towards Ithaki very early in the morning. I was alone in the cockpit all my girls were sleeping and around 8.15 I heard on the radio that a big earthquake has taken place in Leykada an island very close to Ithaki. The magnitude was 6,4 Richter scale and the radio followed the developments on the Islands. I got a phone call from a friend mentioning about the earth-quake and if a tsunami wave is around. So it was a motorsailing without many interesting things happening but as we arrived in Ithaki the bay was so beautiful that the whole trip has been justified. Blue-green water clear and nice surrounding a paradise . The girls were very happy and they played all day swimming and snorkeling with their friends from Erini. In the evening we sailed to the capital of Ithaka Vathy. Captains CommentaryAfter swimming in the bay of Frikes we decided to stay overnight in Kioni. The wind had picked up in the afternoon and we enjoyed a sailing of a few miles to the port of Kioni. 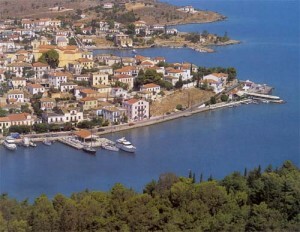 The place was already crowded as Kioni is one of the most beautiful ports of Greece. It reminds me very much of the port of Symi in Dodecanese. The wind was very fierce when we entered the port after our nice sailing around. You really need skills to find a place in the harbor and put your boat among such a tight place with such a wind from the side. All afternoon various charter boats were arriving looking for a place to stay overnight. In the morning we will have problem with our anchor as everybody drops his anchor on top of the others. Captains CommentaryIn the morning after untangling the anchor salad we sailed for MEGANISI lies immediately east of Lefkas. 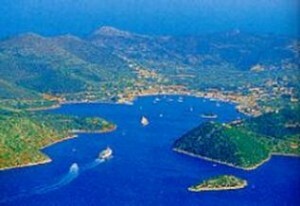 The strait between Meganisi and Lefkas, is one of the loveliest channels in the lonian. 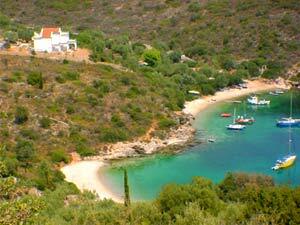 The island has several natural harbors and numerous enclosed bays fringed by olive and cypress with clear blue water. 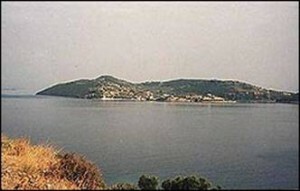 The southwest coast is lined with caves, the most famous being Papanicolis rumored to be the hiding place of a Greek submarine during the second World War. There is some good fishing to be had around this part of the island. 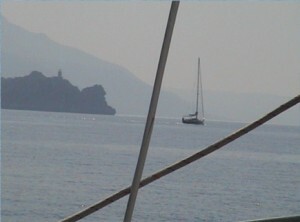 After swimming in the frikes bay very close to Kioni we sailed to Meganissi. The Northwest wind had picked uo and we had a wonderful sailing with a lot of wind and no waves and we made our first race against Erini. We arrived in Spartohori and found our friend who helped us to moor the boat.The high village of Spartohori on the island of Meganissi can easily be seen from the north and west. 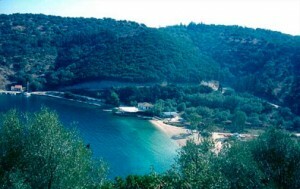 Once you are in the bay the small harbour will be seen. Good shelter, though you will have to anchor in considerable depths (15-25 m). With NE winds (night!) 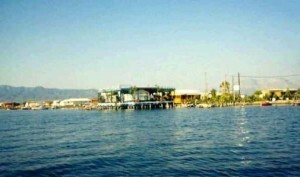 the anchorage near the taverna is the best location in the bay. The village of Spartohori – enjoy the beautiful winding road to reach it – is enchanting and definitely worth the climb. Except Spartohori, Meganissi has a number of picturesque bays (no buildings or facilities), where you can anchor and tight a rope to ashore to prevail swing. Captains CommentaryIn the morning the girls wanted a ride with the dinghy so we took the dinghy and make a trip to Skorpios the Island of Onassis. The girls liked very much the ride especially when the could make the dinghy jump in the wakes of other boats. We decided to stay for one more day in a desserted bay in Meganissi and enjoy the sea and the quitness of the place. In the night we decided to make a walk to the main village Vathy and enjoy a dinner in a fish restaurant. The place was empty as all the tourist had left due to the earthquake in the adjacent Island of Leykas. After dinner we had an adventure as the owner of the restaurant decided to bring us back to our boats with his motorboat and he forgot to put enough gasoline and we remained without motor in the night in the labyrinth of the meganissi bays. But this what remains in your memory. Captains CommentaryWe started to motor and stopped in Porto-Leone for swimming and lunch. The sea was not very nice there as the wind was changing all the time and brought some debris. Anyhow it was a reward the nice sailing we had afterwards for one hour . Erini left for Levkas. We are going to meet the next day again.Kalamos is a very quite place and the port has been extended so many flotilla boats are moored there. It was hot but strong north wind was blowing so we had a nice attraction of the boats trying to moor. We had a nice fish for dinner and there are no cars on the island the children could play around without problem. Captains CommentaryIn the morning we were invited by some friends in a nearby hotel for swimming and lunch and we went there by dinghy. After lunch the wind picked up as always and I was anxious to return to the boat and sail to Ithaka. It was the best sailing we had. Strong wind from the side and we reached over 9 Knots the children and Gianna enjoyed very much the strong wind without monster waves which we have in the Cyclades. We arrived by sails to Vathy until the entrance to the port it was beautiful and once again we appreciated the value of the Super Maramu. We were able to reduce the sail area online according to the gusts which were over 25-28 Knots. With which boat you can handle so easy the sails have so much fun in sailing than the Amel? Most of the other boats were motoring as it was not easy conditions.We found a very uncomfortable place in the harbor near a huge cruising caique which was running the generator all night. It was awful we left early in the morning after buying some provisions from the market for Sarakiniko. Captains CommentaryWe arrived there to relax and prepare ourselves for the passage back home. We stayed overnight in this magnificent bay and we had a lot of swimming, snorkeling, cooking etc. The way back is always stressful and long. Captains CommentaryOn our way we stopped in Skrofa near the Oxia Island for a swim. This place is very close to Achelloos river and the water is very low in salt. For the first time also I found out that there was a tide from the river flow. The water was very deep and unclear and we were told that sharks are frequenting the place as in Oxia are a lot of fish cultivating cages. So it was not our best place during the trip. After lunch we had very nice sailing towards Messolonghi at least we had a reward after a lot of motoring. The children were all together on our boat and we had a nice easy sailing near the coast.Messolonghi reminds me of Philippines . A lot of houses are build on the water and you see people swimming in the sump. It is not the nicest place in Greece but we had recommendation for a very good restaurant so at least we had a good dinner after so many miles. Captains CommentaryWe had to motor sail all the way. The wind between Rio and Antirio was very strong so I was happy to be on an Amel with the protection it provides otherwise I should have been wet as we had to motor against the wind and the waves. We passed through the pylons of the new bridge that is under construction and we had to be in touch with the VHF with the bridge control so we are monitoring the channel 14 and went through the buoyed channel without problem. Everybody was sleeping so I had to do everything alone but on a Super Maramu this is no problem. We arrived in Galaxidi after stopping for a swim in a very strange place with extremely deep water very near to the coast . The children had a nice time playing on Erini and jumping from the a rope fastened to the spinnaker. They can be happy with few things. For an unknown reason I like Galaxidi. Perhaps is the nautical heritage of this place. We found a good place to moor the boat and by 8 oclock everything was packed full. We had a nice dinner as there are many nice restaurants in Galaxidi and the children went to the movies so everybody had a nice time. Captains CommentaryThe wind was practically 0 Bft. No sailing today just motoring. In Corinthiakos very often you can meet dolphins this time one baby dolphin was waiting us in the entrance of the Canal perhaps to say good bye. The children were very happy with this encounter.All nice things come to an end. 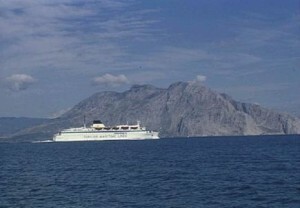 We have to say good bye to our friends from Erini as our routes are separating in the Corinth Canal. We continue to Kalamaki our home Port and they sail to the Cyclades. We will meet again in September in Saronicos. Written by: admin on September 19, 2010. Last revised by: on September 27, 2011.